I made a bus map. Not just an image, but a dynamic “slippy map” rendered at several zoom levels. This was my “hack” for the RewiredState, National Hack the Government Day”, a gathering of hackers who build something in a day, with the aim of tackling government/society problems, working with government data. Projects are presented at the end of the day. I created the bus map by “rendering” OpenStreetMap data. By this I mean starting from raw map data, the underlying vector data, the coordinates and connections of every road etc, and creating raster images arranged in tiles at several zoom levels, for the map display linked above. 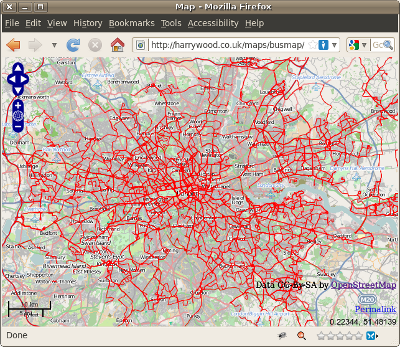 Edit ‘generate_tiles.py’ to specify the london bounding box and zoom levels. Initially I’ve rendered zoom levels 7 to 15. Test using ‘generate_image.py’ before re-running ‘generate_tiles.py’ to re-render the tiles. Among the list of rendering examples linked above, is the one called “öpnvkarte.de” which shows bus routes throughout europe. 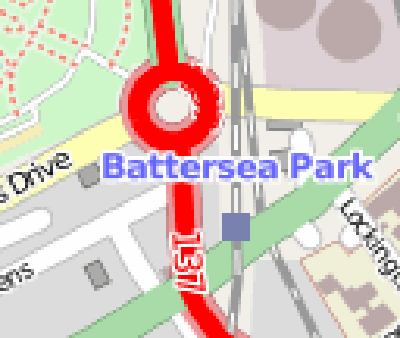 In fact this is one of the best examples of customised OpenStreetMap rendering. Really nice colour and style choices with subdued colours for the background features enhancing the bold transport lines very clearly. So bus route rendering has certainly already been done. What’s the point in my map then? öpnvkarte is very german. It’s named after a german transport network. The map is quite literally centred on Germany, and you’ll have noticed it has an un-typeable german character in it’s URL (although Shaun has provided openbusmap.org as a more sensibly named proxy). Petty irritations perhaps. So what else? As far as I’m aware öpnvkarte hasn’t been updated in a while, so by re-rendering today’s openstreetmap data, we can see how the community has progressed with adding more routes. I was slightly disappointed to find that there wasn’t much difference in London actually. Just one or two details. Compare here with here. But OpenStreetMap people tend to be motivated a lot by renderings and other uses of the data they’re gathering. If the bus map stops being updated, then people stop adding bus routes. Wordwide tile rendering and re-rendering of updates, are tricky technical challenges. Obviously the developer of öpnvkarte is under no obligation to do these things, it’s just a shame that he doesn’t. More of a shame is that he doesn’t (as far as I’m aware) share his stylesheet config files. Again he’s not obliged to do so, and given the amount of work he must have put into it, perhaps it’s understandable. But sharing stylesheets would allow people with hardware and tuning know-how to have a go at tackling these other hosting challenges. So those are a few weak justifications for starting all over again and attempting to build a different bus map stylesheet. My mapnik config files are hopelessly rudimentary so far, but it’s a start. Mostly though, this is just another baby step in my slow climb up the Mapnik learning curve. I wrote a diary entries back in January about this, but until this weekend I hadn’t tried anything further. The important point I did remember to make in my 2 minute slot: Next weekend we’re having a London OpenStreetMap hack weekend. I must try to prepare this time! Thanks to the hard working RewiredState organisers and their sponsors (wired uk, tso, dxw) for a great day, and for all the free penguin biscuits and beers in the pub afterwards.